Sometimes, we all need a little extra motivation to push us towards our goals. For me, in a time where I’m not really training for anything, this is especially true! Or even if you are working towards something, a little treat always feels good. 2. Pamper yourself. If you’re like me, you don’t pamper yourself enough. I get manis and pedis occasionally but not that often. Whenever I do this, or get a new haircut, I always leave the salon feeling confident and well-manicured. Don’t get massages often? Save it for after your longest run ever, or after a tough race…what a great way to relax and work out those knots. 3. Save up. Pampering yourself costs money. A great idea I saw on Pinterest a while ago was to put $1 in a jar every time you hit the gym. If you go 5 days a week for a month, you’ll have about $20 at the end (thank you captain obvious, I know). $20 = two manicures! Or save up for a big workout clothes shopping spree…or a massage…or a blowout…or new running shoes (that’s what I splurge most on). 4. Eat dinner somewhere new. We’ve all heard the saying “Don’t reward yourself with food, you’re not a dog.” That’s not what I mean. Find somewhere with a great, healthy selection and go out on a dinner date. Nothing better than a delicious salad or a good chicken dish after a hard workout. 5. Be a tourist in your own town. Visit a new museum, park, etc. in your town. I can name probably 10 places in my area that I haven’t been to in all the time I’ve been here. Hey, I’m 45 min outside of the city and I, myself, haven’t been to the Statue of Liberty yet. Also, check out your library for special coupons or deals. I just found out my library gives away passes/tickets to the Guggenheim Museum and the Brooklyn Botanical Gardens. I need to do this before the summer ends! 6. Take a new fitness class. After training for a race for months, I need a break from running. Same with lifting. Taking a new fitness can help reignite your passion for fitness, and you may also find your new favorite way to exercise. If you’re in a plateau, either physically or mentally, find a new class or club (like a running club), to try out. 7. Get someone else to reward you. Hey, massages are expensive…so why not get someone else to buy one for you This is a good incentive for couples. Perhaps you and your significant other (or you could also do it with your best friend) make bets based on your goals…winner gets the reward! Who else is competitive? 8. Buy something you’ve wanted for a while. Recently, I splurged on a pair of Ray Ban Wayfarers. I’ve wanted them for so long but never bought them because I rarely spend a lot on myself. I always tell myself that money is put to better use. Well, this time I got the sunglasses I’ve been wanting for years. I bought them to reward myself to getting new clients for my business, and you can do the same for any big goal you set and achieve. What’s the last thing you splurged on for yourself? Do you like to splurge or are you like me? What would you add to this list? Leave a comment below! Lately, I have not been the best with eating. In fact, for weeks now I just haven’t cared as much. I mean, I haven’t been eating like total garbage. I eat a pretty healthy breakfast, lunch and dinner. It’s just what’s been had in between those meals that hasn’t been great. And it seems months of being lax has caught up to me. I’m just not happy with myself now. I know I did this to myself. It’s my own fault considering I’m the one who decides what goes into my body. I’ve definitely eaten too many cookies, too much ice cream…too many sweets in general. Each week I try to eat better, but my sweet tooth has just gotten the best of me. I can’t control it. Has this happened to anyone else? Anyway, this weekend I went out with friends and we took a bunch of pictures, and I just was not happy at all with how I looked. Once I saw the pictures, I felt self conscious about how I looked, and the next day I thought, “I really need to make a change.” Those pictures just made me feel…gross, for a lack of a better word. I know that if someone, such as a client, was telling me this, I would tell them not to be so hard on themselves. I mean, how many times have we seen this quote? But at the same time, I just know I need to make a change. This is probably the heaviest I have been…and it’s definitely not muscle. My workouts have been great. I mean, I exercise pretty much every day. But you know that saying about how you can’t out exercise a bad diet? Yeah, it’s true. This weekend I ordered a nutrition plan to get back on track. I will let you guys know which one it is and my thoughts once I get it. I want to do a full review of it myself before I post about it. How can I be so motivated workout-wise, but just not at all nutrition-wise? Why is eating clean so hard? Especially after you’ve fallen off the wagon. I’d like to lose 10 lbs, since that is about what I have gained. But ideally, I just want to feel comfortable with myself again! I just wanted to get this off my chest and see what your thoughts are. Any tips would certainly be appreciated. Have you gone through something similar before? How do you bounce back after falling off, whether it’s with exercise or nutrition? Can someone explain to me how it was 60 degrees yesterday and will be back down to 25 tomorrow?? Well, it was good while it lasted I guess! Balance Your Sweets With These 5 Small Switches (Sarah Fit) – Great tips if you have a major sweet tooth like me…and just great tips in general. We should all aim to eat a red, orange or green fruit/veggie with each meal. Bang Bang Cauliflower (Carrots N’ Cake) – I always thought cauliflower was so blah…will definitely have to try this recipe! The Best Parts Of Fruits & Veggies You’re Not Eating (Huff Post) – Very insightful. Do you shop at a Whole Foods, Trader Joe’s or just your general grocery store? I’ve been reading a lot about Aldi’s recently but have no clue what that is…none near me! Trigger warning: I will be somewhat discussing eating disorders. When I first started my blog on Tumblr in 2010, a lot of posts I saw were “thinspo” or “thinspiration” which included pictures of girls with thigh gaps. It took me back to the days where a friend told me she wanted a thigh gap, and that your thighs shouldn’t touch. At the time, I wasn’t a personal trainer yet, so I didn’t think much of this, and didn’t think it was unhealthy or anything to want a thigh gap. I was remembering all of this because I saw Cassey from Blogilates posted on her Facebook page about searching for #thinspo, #thighgap and #skinny on social media platforms…I’ll get to that further below. 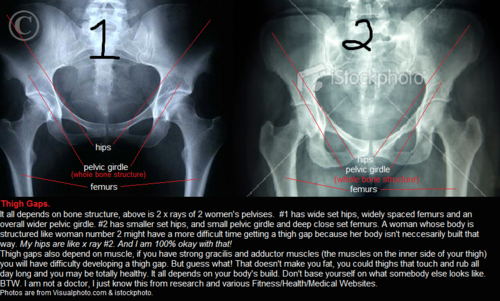 If you’re not sure what a “thigh gap” is, look it up on Google and a ton of pictures will show up. Girls are chasing something that they may never achieve, and may be doing unhealthy things in order to get the thigh gap (like eating less). Now, I’m not saying that people with thigh gaps are unhealthy. I’m saying that we shouldn’t be so focused on one body part, no matter what it is. While social media certainly helps promote thigh gaps and helps girls spread these “thigh gap workouts” and “thinspo,” social media platforms are also doing a good job of letting users know that searching for these key terms isn’t necessarily healthy. Cassey from Blogilates reminded me of this (as I mentioned in the first paragraph). 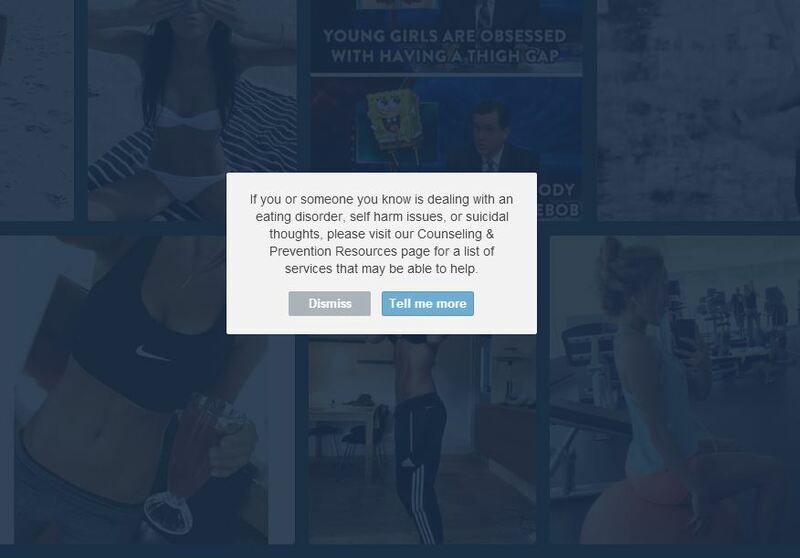 I knew Tumblr had a pop-up message, but wanted to explore other pages as well. I think it’s a great message, and helps to promote healthy goals, as well as possibly help those who need it. Cassey mentioned that no posts came up on Instagram for “thigh gap” and I searched as well, and it comes up as blank. However, if you search #skinny, a similar text pop-up as the Pinterest and Tumblr ones comes up. Whether it’s thigh gaps, flat stomachs, “toned” arms, etc. I always feel disheartened when someone is so focused on one part of their body. Sure, I want to lose some belly flab, but I know that there are healthy ways to go about it, and also know that it’s possible I may never have a visible six-pack. As I mentioned, it’s a problem when something like this is obsessed over, and the sole goal of eating “healthy” and working out. Like I said, I’m not bashing anyone with a thigh gap. We shouldn’t focus on whether or not we have one…but why not shift the focus to how strong our legs are? Girls should strive to make their legs stronger, whether it’s through running, lifting, CrossFit, etc. I’m glad social media platforms are also standing up and trying to help those who may need it. It’s a step in the right direction. What do you think about the thigh gap? Have you heard of it before? Time to be positive: Leave a comment with your favorite body part and why you love it! Dark Chocolate Banana & PB Bars (9-to-Fit) – Um…yum? What The Heck Are Macros (Toned And Fit) – Great, quick overview of macros and how the whole “If It Fits Your Macros” thing works. I actually wrote a post explaining it more here. I’m all for IIFYM if you are eating healthy foods too (and not-so-healthy ones in moderation). 13 Fitness Challenges That Will Destroy You (STACK) – I really want to try the 10/10 challenge. The trainer says average people will probably last a minute or less. To quote How I Met Your Mother: Challenge accepted. Check out those challenges…which do you want to try? Or do you have a fitness test of your own that you use to see how fit you are currently?